We've had two batches of Carolina Wrens nesting in a wren house hung on our porch. 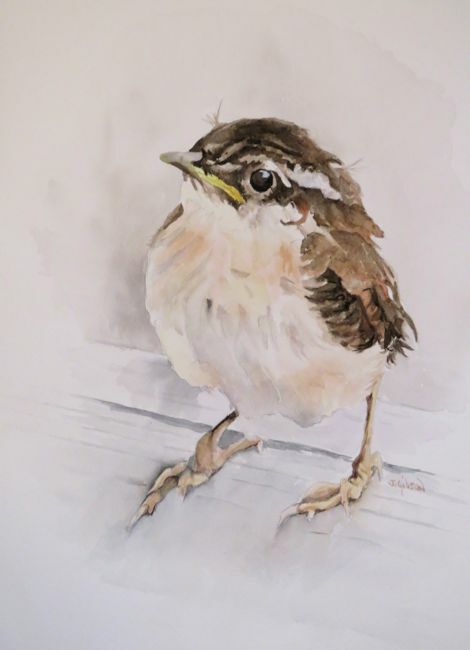 I was lucky enough to get a few photos when the babies fledged and the following is a painting of one of the babies. Transparent watercolor, 10 x 15" on Arches CP. C&C welcome as always. Wow Jan, this is really lovely! I only have compliments, nothing constructive to add; I love how you have handled the "negative space", that is, the part that is "not" the bird, too!!! Love the painting. The expression on the wren's face is just precious. Thank you both, the little wrens are very special to us and we were very surprised when they chose to nest in our box on the porch (twice!) as it's right outside our kitchen door. Carolina Wren babies don't fly away immediately but linger on the ground for quite a while before they leave for good which gave me good opportunity for photos. Wooooww! This is truly gorgeous. Good Job Jan.